At a time when the economic crisis is forcing companies to reduce costs and cut jobs, retail giant Wal-Mart has emerged as the biggest employer in the world with a whopping 2.1 million people working for it last year, according to the Fortune magazine. 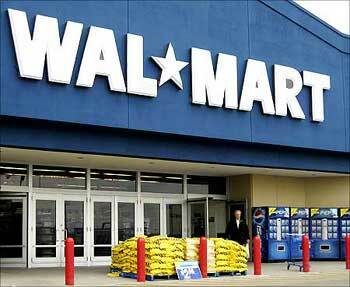 The Fortune Global 500 list ranks Wal-Mart Stores as the top company in terms of employee strength at the end of 2008. Wal-Mart Stores, Inc runs a chain of department stores across the globe. Founded by Sam Walton in Rogers, Arkansas in 1962, Wal-mart is the largest grocery retailer in the United States. It also owns and operates the North American company, Sam's Club. Wal-Mart operates in Mexico as Walmex, in the United Kingdom as Asda, and in Japan as Seiyu. It has wholly owned operations in Argentina, Brazil, Canada, and Puerto Rico. Wal-Mart's operations can be fragmented into three divisions: Wal-Mart Stores US, Sam's Club, and Wal-Mart International. The company does business in nine different retail formats: supercenters, food and drugs, general merchandise stores, bodegas (small markets), cash and carry stores, membership warehouse clubs, apparel stores, soft discount stores and restaurants. "In 2008, Wal-Mart racked up $30 billion in additional sales -- the equivalent of adding the annual sales of a Fortune 75 company. That growth was fueled by double-digit sales increases at international stores (US sales only grew six per cent). Wal-Mart China alone added 28 stores over the year," says the magazine about Wal-Mart. Wal-Mart's 2009 prospects remain promising as shoppers battered by the recession shop for value, it added. The retailer has seen 7.2 per cent increase in profit at $405,607 in 2008 as compared to the previous year. Wal-Mart's operations have often come under the scanner for its huge foreign product sourcing, low employee health insurance enrollment, resistance to union representation, alleged sexism etc. Image: A Wal-Mart store in Toronto. The China National Petroleum Corporation is a state-owned fuel-producing corporation and the largest integrated oil and gas company in the People's Republic of China. CNPC, China's flagship energy enterprise, plays an important role in China's oil and gas production and supply. The company produces 2.75 million barrels of crude oil and 5.6 billion cubic feet of gas per day. It has 3.06 billion metric tons of oil reserves and 2,320.1 billion cubic metres of gas reserve. 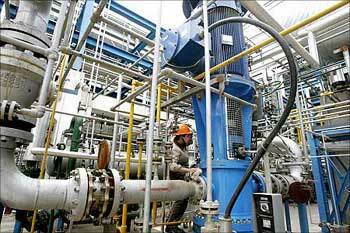 CNPC's oil and gas production account respectively for 57.7 per cent and 78.3 per cent of China's total output. Image: A worker checks equipment inside China National Petroleum Corporation Lanzhou Chemical Company in Lanzhou. State Grid Corporation of China was founded on December 29, 2002 as a pilot state-owned corporation by the State Council. SGCC's core business is to build and operate power grids and provide power supply. The company has registered capital of RMB 200 billion yuan and service area covering 26 provinces. By the end of 2005, SGCC accumulated a total asset of RMB 1176.7 billion Yuan with a debt-asset ratio of 61.96 per cent, and possessed 195,899 km of 220KV and above transmission lines with a transforming capacity up to 616.64 GVA. SGCC serves 128 million customers. 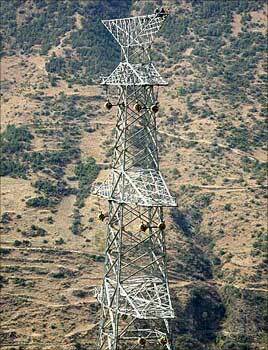 Image: Electricity workers sit atop a newly constructed high-tension electricity tower in China. Indian Railways is the single largest employer in India and the fourth largest the world over, with 1.42 million employees. The state-owned Raliways are also on the verge of hiring more people soon. Recently, Railway Minister Mamata Banerjee said that Indian Railways, one of the world's largest and busiest networks, will be filling up close to 170,000 vacant posts. Once that happens, Railways could well become the world's second largest employer. 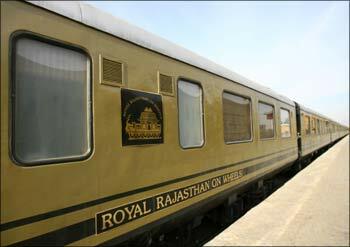 Indian Railways transports close to 20 million passengers everyday. Image: Indian Railways in India's single largest employer. The United States Postal Service is an independent agency of the US responsible for providing postal service in the country. In the US, it is often referred to as the Post Office, Postal Service, or US Mail. The USPS operates the largest civilian vehicle fleet in the world, with an estimated 260,000 vehicles. The company's employees deliver mail at an average yearly cost of $235 per residence as of 2009. Fierce competition from Internet, e-mail and private outfits like United Parcel Service and FedEx has forced USPS to adjust its business strategy and to modernise itself of late. 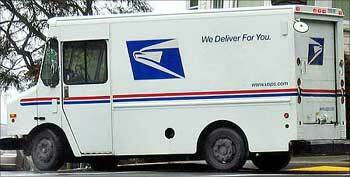 Image: A US Postal Service vehicle. Sinopec, or the China Petroleum and Chemical Corporation is one of the major petroleum companies in China. Sinopec's business includes oil and gas exploration, refining, and marketing; production and sales of petrochemicals, chemical fibers, chemical fertilisers, and other chemical products; storage and pipeline transportation of crude oil and natural gas; import, export and import/export agency business of crude oil, natural gas, refined oil products, petrochemicals, and other chemicals. In April 2007, a raid by an ethnic Somali rebel group on a Sinopec drilling site eastern Ethiopia's Ogaden desert left 74 dead, including 9 Chinese oil workers. Seven workers were abducted as well. The Ogaden National Liberation Front later released the seven abductees and warned foreign companies against working in the area. 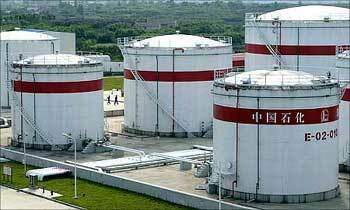 Image: Oil tanks are seen at a Sinopec plant in Hefei, Anhui province, China. China Telecom Corp. Ltd. is the largest fixed line service and mobile telecommunication provider in the People's Republic of China. As of April 2008, the company provided services to 216 million subscribers. The company was formerly a state-owned monopoly, but now divided into largely autonomous provincial branches. China Telecom has been listed on the Hong Kong and New York stock exchanges since 2002, but the Chinese government still retains majority ownership. 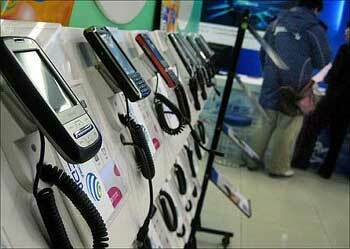 Image: China Telecom products are on display. Carrefour is a French hypermarket chain with outlets worldwide. Carrefour means 'crossroads' in French. It is the largest hypermarket chain in terms of size, and the second largest retail group in revenue and third largest in profit after Wal-Mart and Tesco. Carrefour operates mainly in Europe, China, Colombia, Brazil, Argentina and in the Dominican Republic, but also has shops in North Africa and other parts of Asia. The first Carrefour store opened in June 1957, in suburban Annecy. The group was created by Marcel Fournier, Denis Defforey and Jacques Defforey and grew into a chain from this first sales outlet. In 1999 it merged with Promodes, known as Continent, one of its major competitors in the French market. 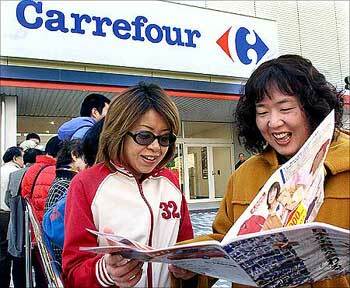 Image: Japanese women wait for grand opening of Carrefour in Makuhari.